This article is about Catholic beliefs on prayer. For a scientific perspective and the analysis of empirical data obtained from studies on prayer please see the article on "efficacy of prayer". 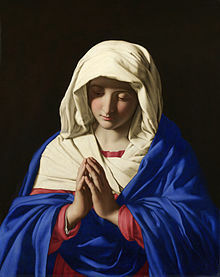 The Virgin Mary in prayer, by Sassoferrato, 17th century. Prayer may be expressed vocally or mentally. Vocal prayer may be spoken or sung. Mental prayer can be either meditation or contemplation. The basic forms of prayer are praise, petition (supplication), intercession, and thanksgiving. Roman Catholic teachings on the subject of prayer are contained in the Catechism, where quoting St. John of Damascus, prayer is defined as "...the raising of one's mind and heart to God or the requesting of good things from God". St. Thérèse of Lisieux describes prayer as "... a surge of the heart; it is a simple look turned toward heaven, it is a cry of recognition and of love, embracing both trial and joy." By prayer one acknowledges God's power and goodness, and one's own neediness and dependence. It is therefore an act of the virtue of religion implying the deepest reverence for God and habituating a person to look to him for everything. Prayer presupposes faith in God and hope in his goodness. By both, God, to whom one prays, moves the individual to prayer. Prayer can be divided into vocal and mental types. Vocal prayer is that which is made by using some approved form of words, read or recited; such as the sign of the cross, the Liturgy of the Hours (Divine Office), the Angelus, grace before and after meals, etc. Mental prayer is that which is made without employing either words or formulas of any kind. Catholics are exhorted to beware of underrating the usefulness or necessity of vocal prayer. Common vocal prayers include the Lord's Prayer (Our Father, Pater Noster), the Hail Mary (Ave Maria, Angelic Salutation), the Glory Be (Gloria Patri, Minor Doxology), and the Apostles' Creed (Symbolum Apostolorum). Catholics consider vocal prayer an essential element of the Christian life. Vocal prayer can be as simple and uplifting as “Thank you, God, for this beautiful morning,” or as formal as a Mass celebrating a very special occasion. When two or more people gather together to pray, their prayer is called communal prayer. Examples of communal prayer are the Rosary, devotional prayers including novenas and litanies, classroom prayers, and, most importantly, the Mass. St. Ambrose introduced in Milan antiphonal singing of the psalms "after the manner of the East". Mental prayer was defined by Fr. John A. Hardon, S.J. in his Modern Catholic Dictionary as a form of prayer in which the sentiments expressed are one's own and not those of another person. Mental prayer is a form of prayer whereby one loves God through dialogue with him, meditating on his words, and contemplating him. It is a time of silence focused on God and one's relationship with him. It is distinguished from vocal prayers which use set prayers, although mental prayer can proceed by using vocal prayers in order to improve dialogue with God. Mental prayer can be divided into meditation, or active mental prayer; and contemplation, passive mental prayer. Meditation is a form of reflective prayer which engages thought, imagination, emotion, and desire. There are as many methods of meditation as there are spiritual masters. Ordinary or active mental prayer consists of two operations; one belongs to the thinking faculty which applies the imagination, memory, and understanding to consider some truth or mystery. The other operation is dependent on the will and compels one to love, desire, and ask for the good proposed by the mind, and make resolutions to arrive at it. According to St. Teresa, the soul in this stage is like gardener, who, with much labour, draws the water up from the depths of the well to water his plants and flowers. Contemplative prayer is a silent attentiveness which looks at God by contemplating and adoring his attributes. St. Teresa describes Contemplative prayer [oración mental] as "...nothing else than a close sharing between friends; it means taking time frequently to be alone with him who we know loves us.” In this inner prayer we can still meditate, but our attention is fixed on the Lord himself. Contemplation, like all prayer, is pure gift, and not anything one can achieve. A prayer of petition is a request to God that asks him to fulfill a need. By prayer of petition, Catholics acknowledge their dependence on God. This expression is not intended to instruct or direct God what to do, but to appeal to his goodness for the things we need; and the appeal is necessary, not because He is ignorant of our needs or sentiments, but to give definite form to our desires, to concentrate our whole attention on what we have to recommend to him, to help us appreciate our close personal relation with him. The expression need not be external or vocal; internal or mental is sufficient. The prayer of petition is at its heart an Act of Faith in that the one praying must believe first, in the existence of God; and second, that God is both willing and able to grant the petition. The Catechism states that asking forgiveness, coupled with trusting humility, should be the first movement of a prayer of petition. Jesus said to bring our every need to God in his name and assures that “whatever you ask the Father in my name he will give you.” (John 16:23) Through petition one can ask for God's help with every need no matter how great or small. According to the Catechism, Christ is glorified by what we ask the Father in his name. Intercession is a prayer of petition which leads us to pray as Jesus did. He is the one intercessor with the Father on behalf of all men, especially sinners. Intercession is also a prayer to Mary and the saints on behalf of another person asking God to assist other people with the things they need. Thankfulness is thanking God for what he has given and done. The Psalms have always been an important part of Catholic liturgy. From earliest times until today, Christians view the Old Testament as prefiguring Christ. The evangelists put the words of the psalms on the lips of Jesus during his passion. Along these lines, ancient monks and nuns in the Egyptian desert heard Jesus' voice in all the psalms. They believed the psalms were written by King David, but they also believed that the pre-existent Christ inspired David to do the writing (Ps 110:1). For this reason, they prayed the whole Psalter daily. This tradition has grown and changed, but it still continues, faithful to the ancient practice. In Christian monasteries and many religious houses throughout the world, vowed men and women gather three to seven times daily to pray the psalms. The Liturgy of the Hours is centered on chanting or recitation of the Psalms. Early Catholics employed the Psalms widely in their individual prayers also. Until the end of the Middle Ages it was not unknown for the laity to join in the singing of the Little Office of Our Lady, which was a shortened version of the Liturgy of the Hours providing a fixed daily cycle of twenty-five psalms to be recited. Devotions are prayers or pious exercises used to demonstrate reverence for a particular aspect of God or the person of Jesus, or for a particular saint. Catholic devotions have various forms, ranging from formalized prayers such as novenas to activities which do not involve any prayers, such as Eucharistic adoration, the veneration of the saints, and even horticultural practices such as maintaining a Mary garden. Common examples of Catholic devotions include the Rosary, the Devotion to the Sacred Heart of Jesus, the Holy Face of Jesus, the Immaculate Heart of Mary, and the veneration of various saints, etc. The Congregation for Divine Worship at the Vatican publishes a Directory of devotions and pious practices. The Rosary is a devotion for the meditation of the mysteries of joy, of sorrow and the glory of Jesus and Mary.Sister Lucia dos Santos said:"The Most Holy Virgin in these last times in which we live has given a new efficacy to the recitation of the Rosary to such an extent that there is no problem, no matter how difficult it is, whether temporal or above all spiritual, in the personal life of each one of us, of our families...that cannot be solved by the Rosary. There is no problem, I tell you, no matter how difficult it is, that we cannot resolve by the prayer of the Holy Rosary." In his 2002 encyclical Rosarium Virginis Mariae, Pope John Paul II emphasized that the final goal of Christian life is to be transformed, or "transfigured", into Christ, and the rosary helps believers come closer to Christ by contemplating Christ. "We have to learn to pray: as it were learning this art ever anew from the lips of the Divine Master himself, like the first disciples: 'Lord, teach us to pray!' (Lk 11:1)." In Catholic tradition, there are many legends about the power of persistent prayer. In the fourth century, Saint Monica of Hippo is said to have prayed for the conversion of her son Augustine for fourteen years and he eventually became an influential figure in Christian thought. ^ a b "CCC, 2590". Vatican.va. ^ a b "Expressions of Prayer". How Catholics Pray. Loyola Press. Retrieved 22 December 2012. ^ "Fr. John Hardon's ''Modern Catholic Dictionary''". Catholicculture.org. Retrieved 2012-06-22. ^ St Teresa of Avila (2007). The Way of Perfection. Translated by Benedictines of Stanbrook Abbey. Cosimo, Inc. p. 141. ISBN 1-60206-261-7. ^ Lehodey (1912), p. 5. ^ Lehodey (1912), p. 13. ^ Silf, Margaret (1999). Close to the Heart: A Practical Approach to Personal Prayer. Chicago: Loyola Press. ISBN 978-0-8294-1651-0. ^ "Archdiocese of Boston Four Basic Forms of Prayer". Bostoncatholic.org. Retrieved 2012-06-29. ^ "Archdiocese of Toronto - Devotions". Archtoronto.org. Archived from the original on 2012-08-06. Retrieved 2012-06-29. ^ "Vatican web site: ''Directory of Devotions'' December 2001". Vatican.va. Retrieved 2012-06-28. ^ "The Holy Rosary". The Holy Rosary. 2002-10-16. Retrieved 2017-06-26. ^ "Rosarium Virginis Mariae (16 de octubre de 2002) | Juan Pablo II". The Vatican. Retrieved 2017-06-26. ^ "Message for the 42nd World Day of Prayer for Vocations 2005". Vatican.va. Retrieved 2012-06-29. Catechism of the Catholic Church, Second Edition. USCC, Inc. 1997. Lehodey, Dom Vitalis (1912). The Ways of Mental Prayer. Dublin: M.H. Gill.